If you hadn't heard of it before, you might think hydroponics is a term from a sci-fi movie. To Adam Frye, it's part of the future plans for his farm, Silveus Plantation. As of now, he and current land owner Carl Flowers are sowing the seeds of future farming projects into the 133 acres that straddle the line between Groton, Mass., where the farm is technically located, and Dunstable, where around 30 of these acres lay. Currently, 25 acres are being used as a Christmas tree farm. 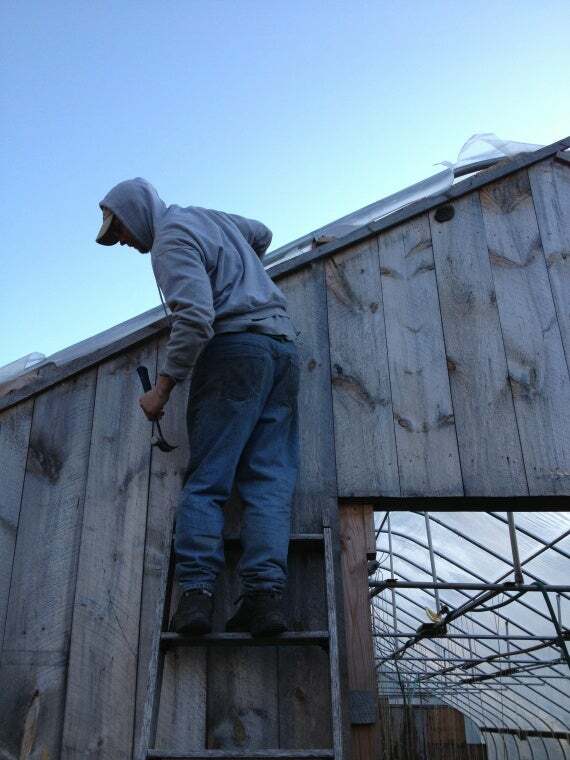 Frye is an ambitious young farmer who began farming at his father's house in Dunstable. As gardening became more than a hobby for Adam, he attended farmers markets and became acquainted with Carl through mutual friends, and soon the two men were planning how to expand Carl's tree farm into a larger farm that would attract people all year round. Some of these plans include bringing animals to the property. Adam's connections to livestock run all the way back to when he was twelve years old, participating in 4H contests. “I've wanted to farm for a long, long time,” Adam says. “I love being outside, and it's the one thing I think about that has to be done.” He plans on keeping cows, sheep, and chickens on the farm, using the space currently filled by the crop of trees he and Carl are growing to also house the chickens and sheep, essentially using the livestock to mow the grass. Obviously, Adam isn't concerned with thinking outside of the norm, and he's thankful for the support he's gotten from Carl and other organizations, including New Entry. New Entry's Farm Business Planning Course was what Adam thought was most helpful in beginning his investment in the farming business. He's also attended various growing clinics, demonstrative field days, and farmers markets in order to expand his knowledge and learn from others experiences. Adam said he'd even been able to get a greenhouse thanks to help from the NRCS. Besides a tree farm with livestock lawnmowers, Adam intends to include a variety of vegetables all year long, if his hydroponic plans pay off. He'd like to include farm staples such as tomatoes, cucumbers, and peppers, while utilizing more of the land to include pumpkins, potatoes, and other root vegetables. With such a large amount of land and an equally ambitious attitude, Adam says he would like to sell wholesale eventually, to go along with various farmers markets and CSAs. Right now, not being GAP certified hinders his ability to go through with the wholesale plans, but Adam is hopeful that as his farm grows, he'll be able to overcome that obstacle. Another challenge that faces Adam is the inheritance tax he faces in the future. Since the land is owned by Carl, when it is transferred to Adam's name he'll face a massive tax due to the sheer amount of land that he will inherit. A lesser cost but expense nonetheless, and one that faces Adam more immediately, is the cost of clearing land. While there is plenty of open field space, much of the acreage Carl owns is wooded, and turning forest into field is a costly endeavor.